Crafted in the centuries-old tradition of Europe's finest chocolatiers, our rich, creamy truffles offer the ultimate in chocolate enjoyment. Each decadent center is carefully blended for supreme smoothness, then gently dusted with premium cocoa to create a soft, sophisticated finish. The silver metallic gift box is foil-stamped in black and tied with a silver bow. Individual mailing cartons are available at an extra charge. Also Available with Pecan Turtles, Deluxe Mixed Nuts, and Chocolate Covered Almonds, and English Butter Toffee FDA inspected facility. CPSIA & Prop 65 compliant. Exquisite things come in small packages. 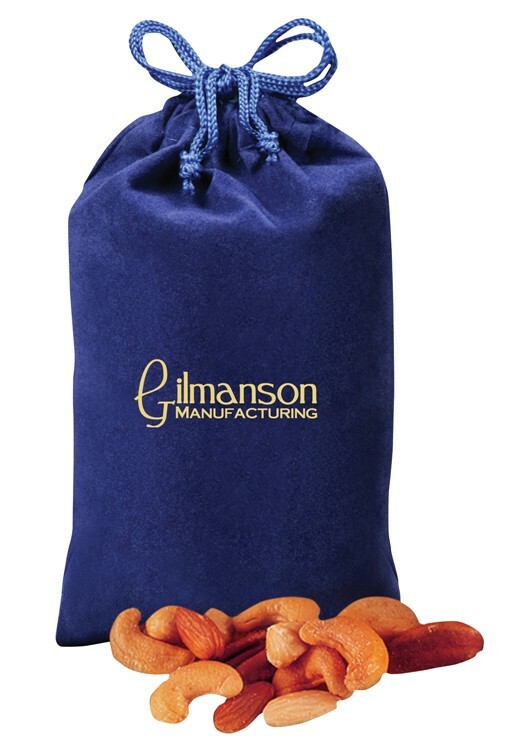 This rich blue velour pouch is foil-stamped in gold with your logo and packed with five-ounces of fresh-roasted Deluxe Mixed Nuts. To assure freshness, our products are packed in our traditional air-tight bags within the velour pouch. If individual shipment is requested, individual mailers are available at an extra charge. Food gifts are great for any occasion! Certified Kosher Upon Request. Also Available with English Butter Toffee, Pecan Turtles, Chocolate Covered Almonds, Cocoa Dusted Truffles, and Jumbo Cashews FDA inspected facility. CPSIA & Prop 65 compliant. Gummy bears just got a little fancier! 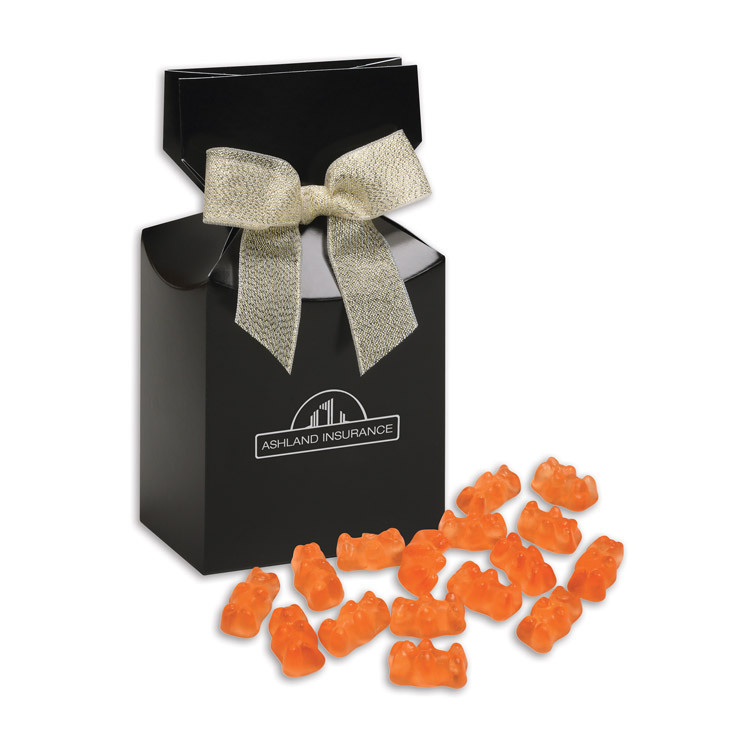 These gummy bears will add sparkle to your gift-giving with the sweet taste of prosecco. 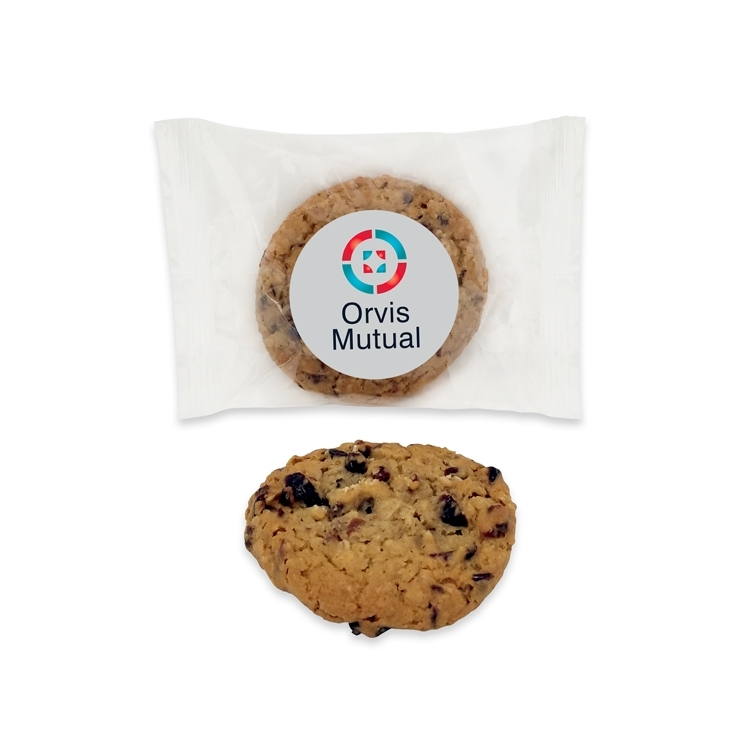 They’re perfect for celebration favors, but also make a sophisticated treat that will brighten any day. Each box is filled with five-ounces of these delicious, non-alcoholic gummies. Black gift boxes are foil-stamped in silver and complete with a neutral metallic bow. Also Available with Pecan Turtles, Deluxe Mixed Nuts, and Chocolate Covered Almonds, and English Butter Toffee FDA inspected facility. CPSIA & Prop 65 compliant. This sparkling festive tower contains an excellent assortment of gourmet treats that's guaranteed to please one and all! 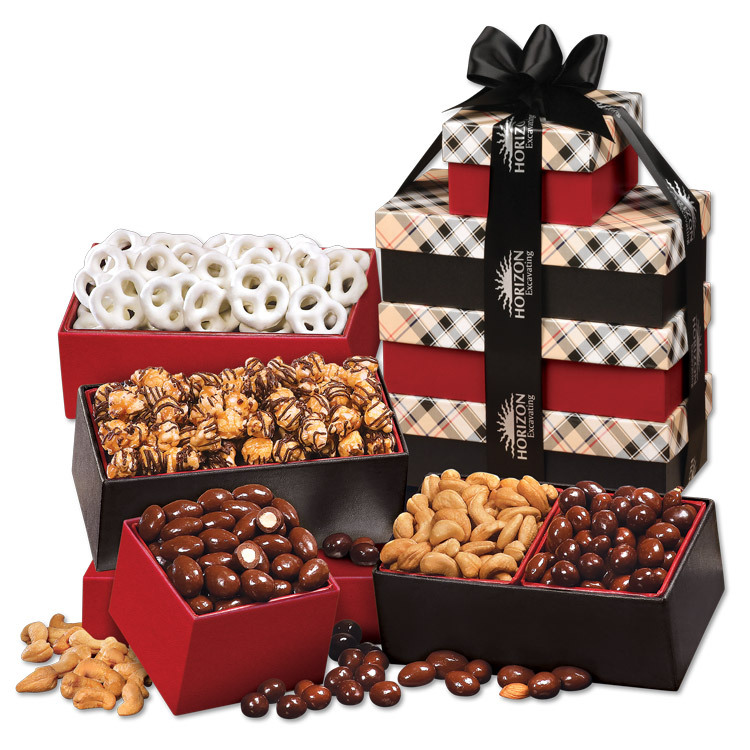 We include fresh-roasted Extra Fancy Jumbo Cashews, our legendary Chocolate Covered Almonds, Chocolate Covered Peanuts, White Frosted Pretzels and Chocolate Sea Salt Caramel Corn. It's almost too beautiful to open, but imagining what's inside is too much temptation for anyone! Your logo is foil-stamped in silver on the navy satin ribbon. Serves 10-15. FDA inspected facility. CPSIA & Prop 65 compliant. The large, elegant, magnetic closure gift box will be perfect for keeping small treasured items, either in the office or at home. 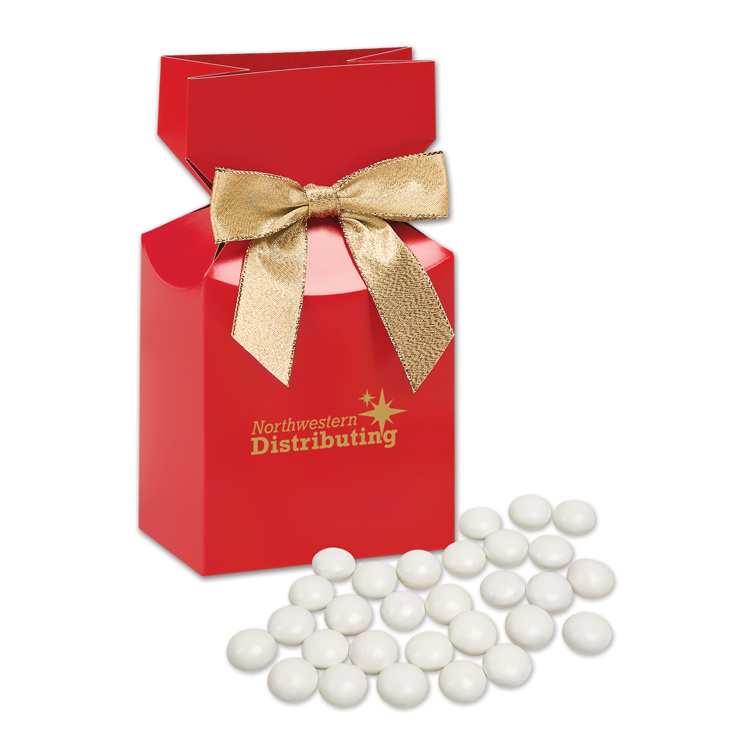 We foil-stamp your logo in white on the lid of this deep red leather-like box then tie it with a matching white grosgrain ribbon. 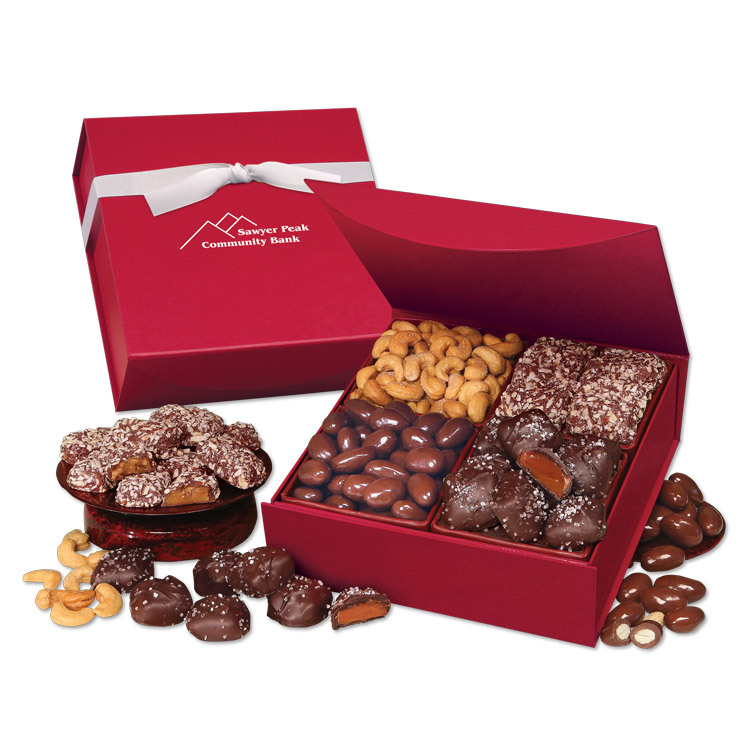 It's filled with an incredible assortment of gourmet treats including Chocolate Sea Salt Caramels, English Butter Toffee, Chocolate Covered Almonds, and Extra Fancy Jumbo Cashews, nearly one and a quarter pounds in all. This gift is guaranteed to bring a smile to their face! FDA inspected facility. CPSIA & Prop 65 compliant. 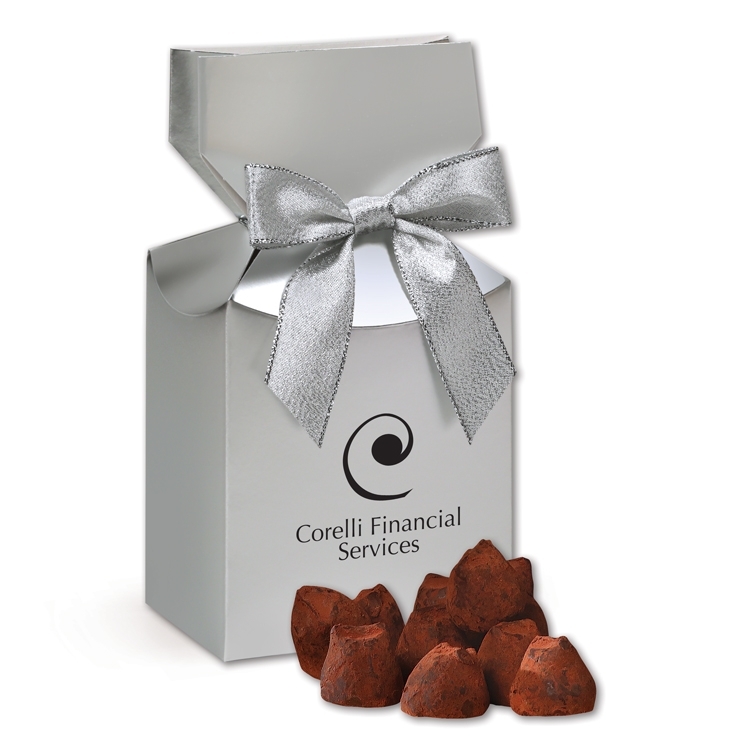 A welcome addition to anyone's desk... our pencil cups come filled with 12 individually-wrapped Cocoa Dusted Truffles! Crafted from American beech wood with a handrubbed oil finish, you can be assured that these pencil cups will be a lasting & useful reminder of your thoughtfulness! Included gold gift box measures 6.5" x 3.625" x 3.5". Pencil cup measures 3.5" x 3.5" x 4". Food gifts make great thank-you gifts! Also Available with English Butter Toffee, Pecan Turtles, Chocolate Covered Almonds, Deluxe Mixed Nuts, and Jumbo Cashews FDA inspected facility. CPSIA & Prop 65 compliant. These jumbo extra fancy cashews are some of the very finest in the world. We roast them carefully to make sure they are extra crunchy, then enrobe them with a sweet, honey sugar coating. 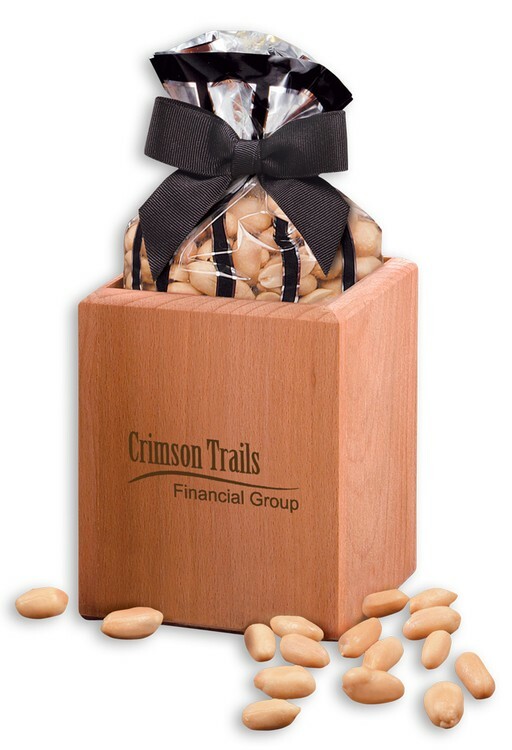 Finally, we package them in a red gift box, wrapped with a decorative plaid sleeve bearing your imprint in black. Individual mailing carton is included at no charge. Certified Kosher upon request. FDA inspected facility. CPSIA & Prop 65 compliant. 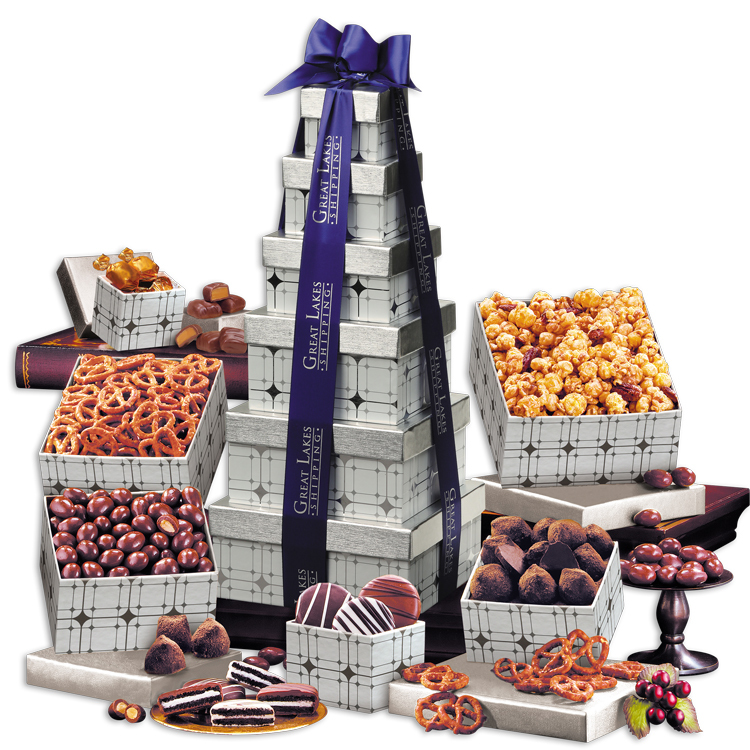 This elegant tower contains an excellent assortment of gourmet treats that’s guaranteed to please one and all! 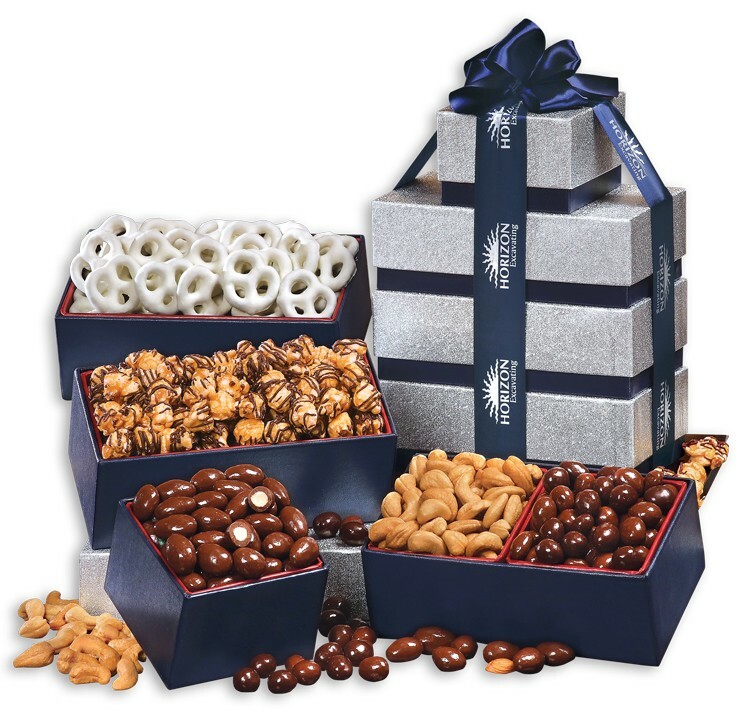 We include fresh-roasted Extra Fancy Jumbo Cashews, our legendary Chocolate Covered Almonds, Chocolate Covered Peanuts, White Frosted Pretzels and Chocolate Sea Salt Caramel Corn. This gift is guaranteed to bring lots of smiles. Your logo is foil-stamped in silver on the black satin ribbon. Serves 10-15. FDA inspected facility. CPSIA & Prop 65 compliant. Will the gifts you select today be remembered a year from now? The answer is "Yes, and even longer" if you choose our Extra Fancy Cashews. 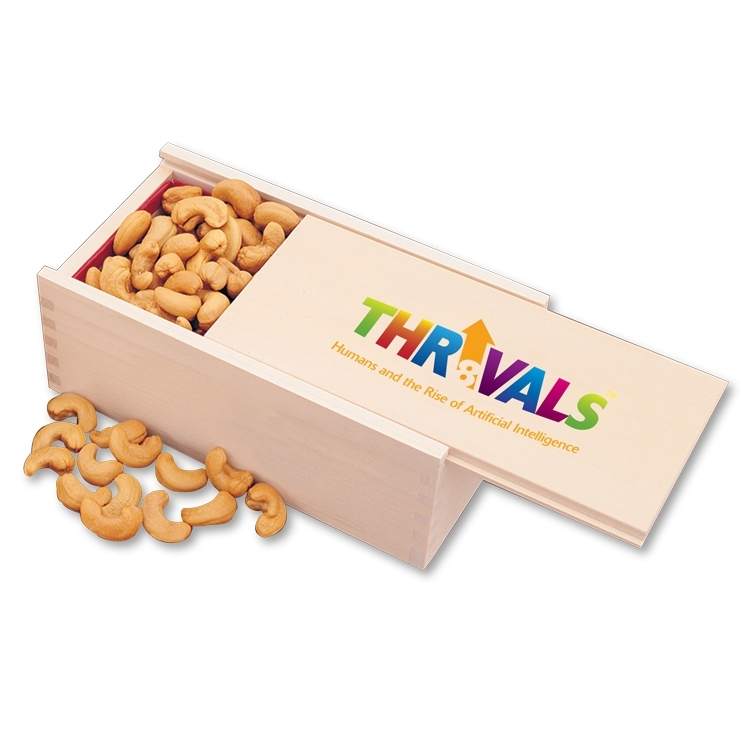 Each lucky recipient will get three-quarters of a pound of those great big, great tasting, freshly roasted Jumbo Cashews-the very finest in the world - specially packaged to preserve freshness. And they'll get an imprinted wooden collector's box to be used and treasured for years to come. Gift box measures 8" x 4" x 3". Food gifts make great thank-you gifts! Also Available with English Butter Toffee, Pecan Turtles, Chocolate Covered Almonds, Cocoa Dusted Truffles, & Deluxe Mixed Nuts FDA inspected facility. CPSIA & Prop 65 compliant. America’s passion for pick-up trucks is evident, but they don’t make them like they used to. Each replica truck, complete with construction ladder, is hand-crafted, hand-painted and will be treasured for years as a collector’s piece. We foil-stamp your logo in silver on both sides. 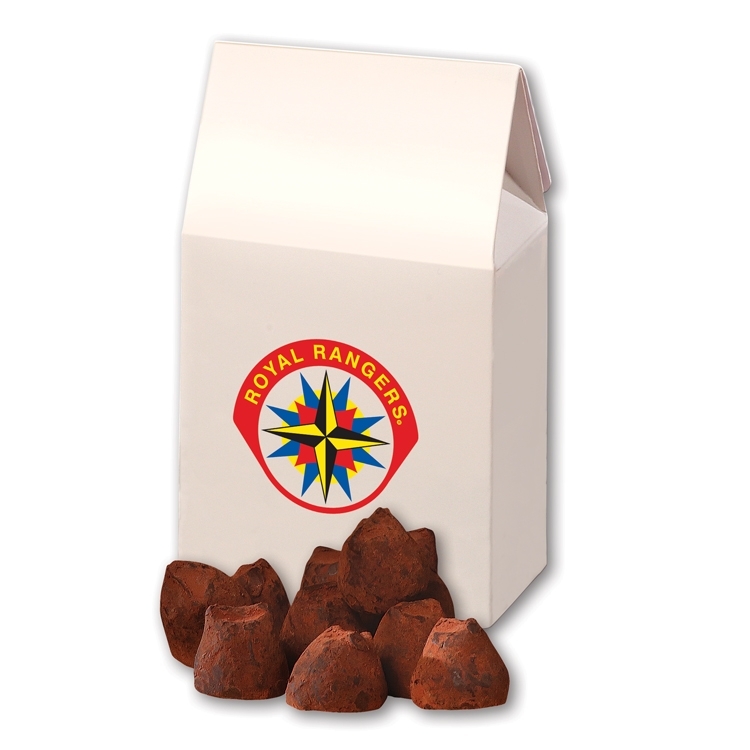 We include a five-ounce package Chocolate Covered Almonds. Because of the demanding craftsmanship each truck will be unique. Limited edition. Certified Kosher Upon Request. 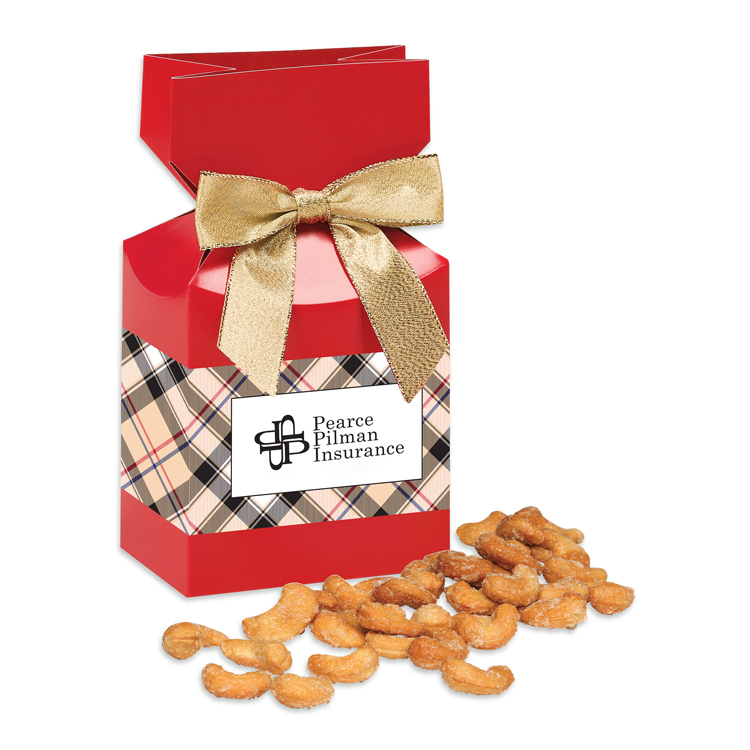 Also Available with English Butter Toffee, Pecan Turtles, Cocoa Dusted Truffles, Deluxe Mixed Nuts, and Jumbo Cashews. FDA inspected facility. CPSIA & Prop 65 compliant. Crafted in the centuries-old tradition of Europe's finest chocolatiers, our rich, creamy truffles offer the ultimate in chocolate enjoyment. Each decadent center is carefully blended for supreme smoothness, then gently dusted with premium cocoa to create a soft, sophisticated finish. 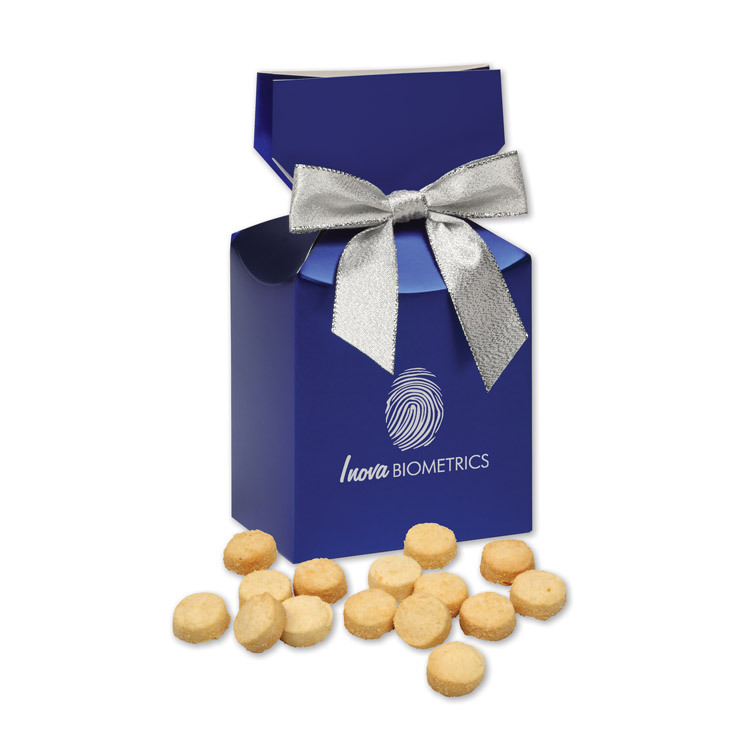 The white gift box contains 11 truffles and is printed with your logo or promotional message in full color. If individual shipment is requested, individual mailers are required at an extra charge. Also available with Pecan Turtles, Chocolate Covered Almonds, & Deluxe Mixed Nuts FDA inspected facility. CPSIA & Prop 65 compliant. This silver tower is nearly overflowing with an expertly balanced combination of sweet and salty flavors to satisfy every recipient. 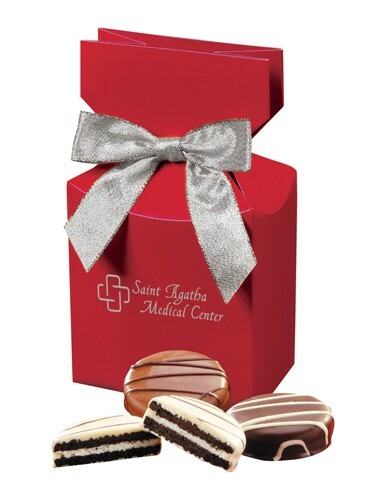 It features an assortment of traditional favorites: delicious Chocolate Covered Almonds, Cocoa Dusted Truffles, Almond Pecan Caramel Corn, Seasoned Pretzels, Chocolate Covered Oreos®; and for the final touch, two pieces of Chocolate Sea Salt Caramels. Your logo is foil-stamped in silver on the ribbon of your choice – black or blue satin. This is a scrumptious selection that is sure to delight all who are lucky enough to receive it! Serves 8-12. FDA inspected facility. CPSIA & Prop 65 compliant. This elegant tower contains an excellent assortment of Kosher gourmet treats that's guaranteed to please one and all! 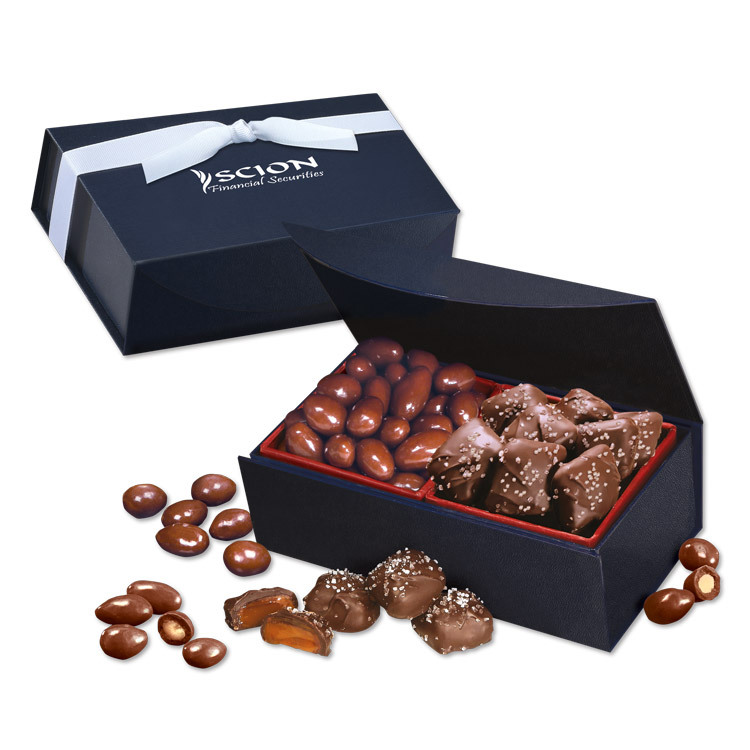 We include our legendary Chocolate Covered Almonds, Honey Roasted Cashews, Chocolate Covered Peanuts, White Frosted Pretzels and Chocolate Sea Salt Caramel Corn. It's almost too beautiful to open, but imagining what's inside is too much temptation for anyone! Your logo is foil-stamped in silver on the navy satin ribbon. Serves 10-15. Certified Kosher upon request. FDA inspected facility. CPSIA & Prop 65 compliant. 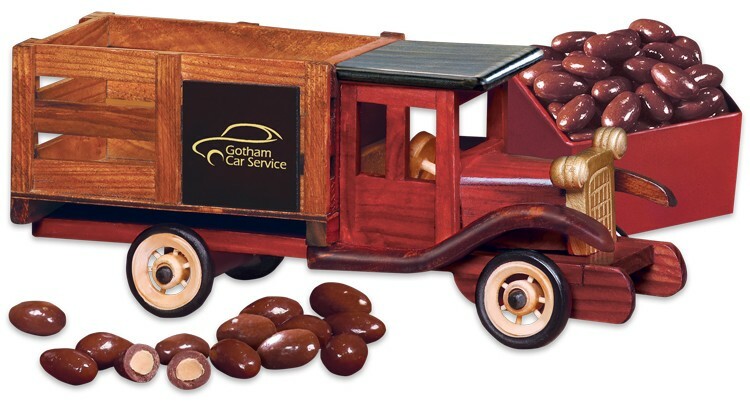 There’s no better way to say “Thank you” or “Season’s Greetings” than with this handcrafted wooden dump truck accompanied by our delicious gourmet treats. 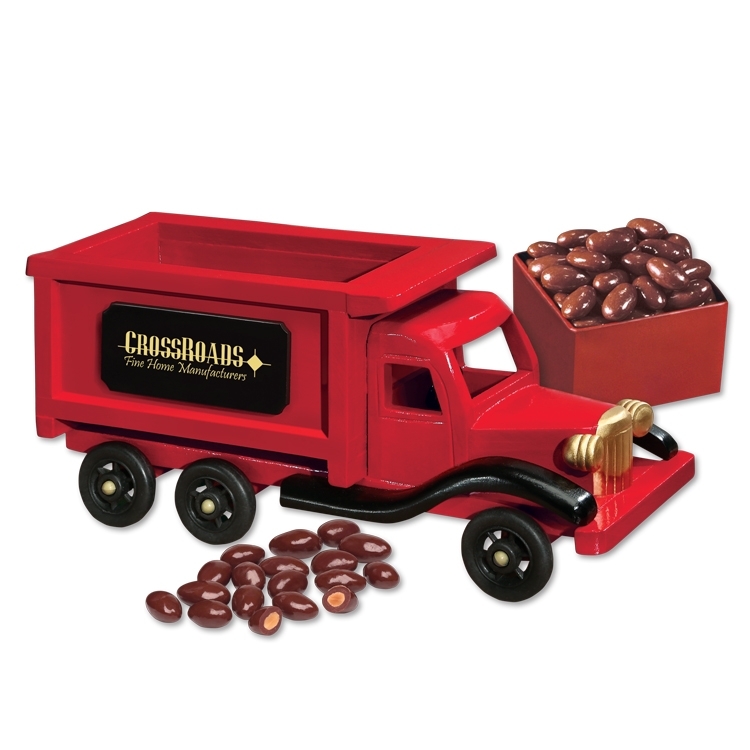 The truck features your logo foil-stamped in gold on both sides and we include five-ounces of Chocolate Covered Almonds. 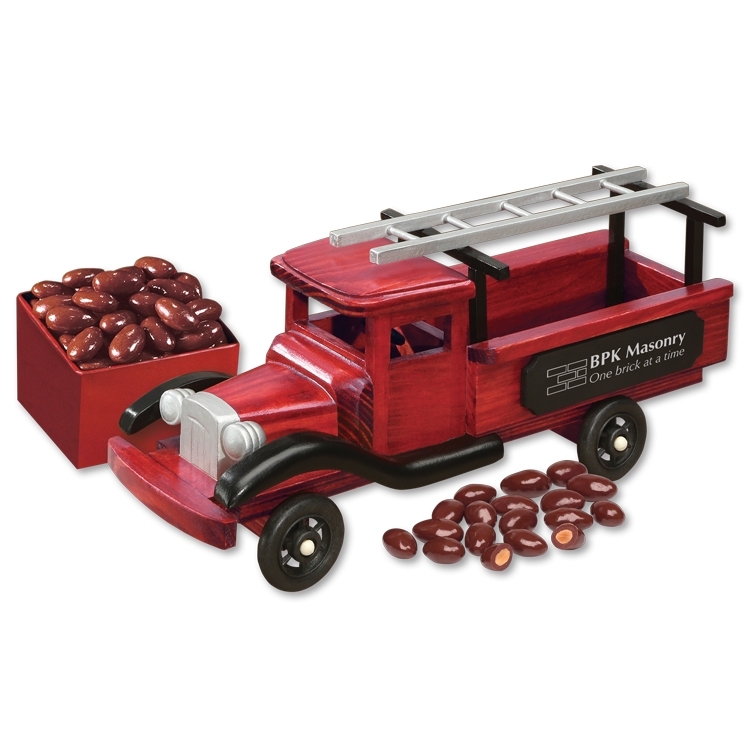 Every recipient of this classic wooden truck will appreciate its craftsmanship and style. Limited edition. Certified Kosher Upon Request. Also Available with English Butter Toffee, Pecan Turtles, Cocoa Dusted Truffles, Deluxe Mixed Nuts, and Jumbo Cashews FDA inspected facility. CPSIA & Prop 65 compliant. A welcome addition to anyone's desk... our pencil cups come filled with Choice Virginia Peanuts, six-ounces! Crafted from American beech wood with a handrubbed oil finish, you can be assured that these pencil cups will be a lasting & useful reminder of your thoughtfulness! Included gold gift box measures 6.5" x 3.625" x 3.5". Pencil cup measures 3.5" x 3.5" x 4". Food gifts are perfect for any occasion! Certified Kosher Available Upon Request. Also Available with English Butter Toffee, Pecan Turtles, Chocolate Covered Almonds, Cocoa Dusted Truffles, Jumbo Cashews & Deluxe Mixed Nuts FDA inspected facility. CPSIA & Prop 65 compliant. Recipients will appreciate the style and craftsmanship of our version of a Classic 1925 Stake Truck almost as much as they'll appreciate the cargo! Both sides of the truck feature your imprint foil-stamped in gold. 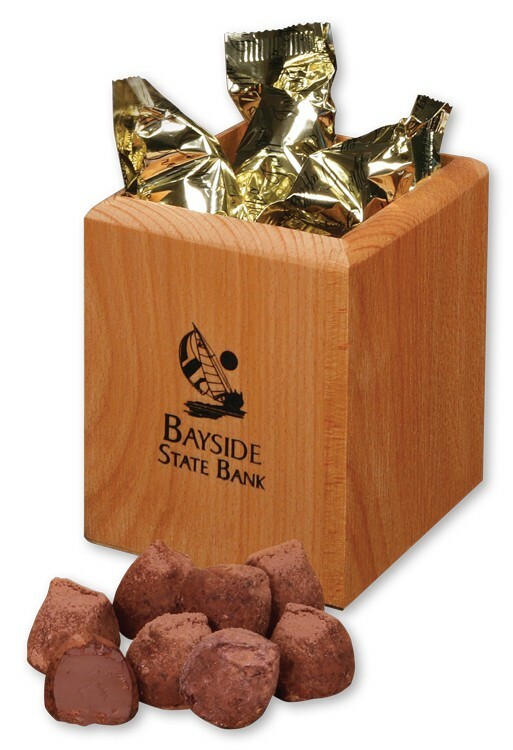 We include Chocolate Covered Almonds, five-ounces. Truck is imported. Food gifts, always the best business gift! Certified Kosher Upon Request. Also Available with English Butter Toffee, Pecan Turtles, Cocoa Dusted Truffles, Deluxe Mixed Nuts, and Jumbo Cashews FDA inspected facility. CPSIA & Prop 65 compliant. Totally irresistible! Our upscale, pillow top gift box elegantly presents these mouth-watering pecan turtles that taste even better than they appear! Specially-selected, large, full-flavored pecans are drenched with rich, creamy caramel, and then enrobed with the finest chocolate. 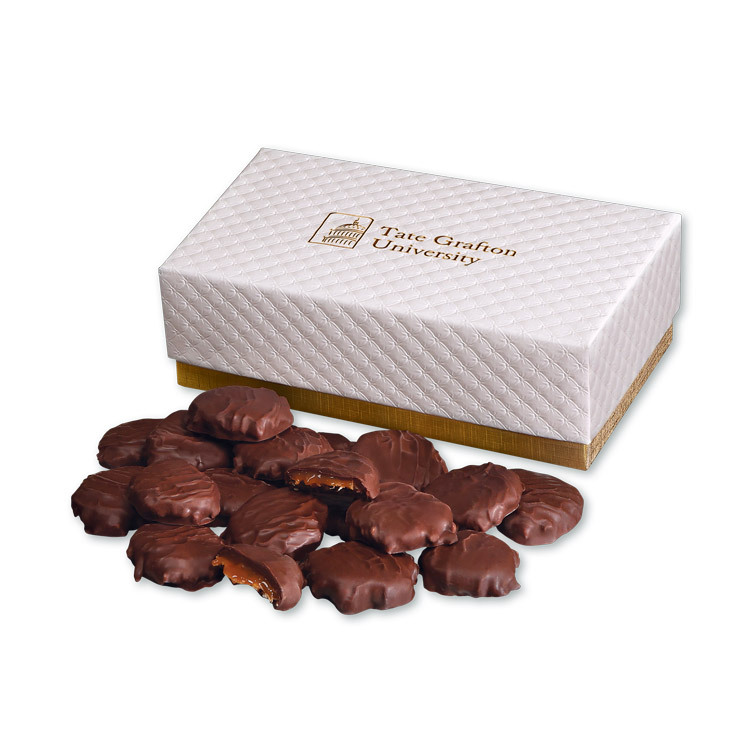 24 of these delicious turtles are packed in this three-quarter pound gift box. This smart-looking gift box brings "Park Avenue" to your gift-giving. Certified Kosher Upon Request. 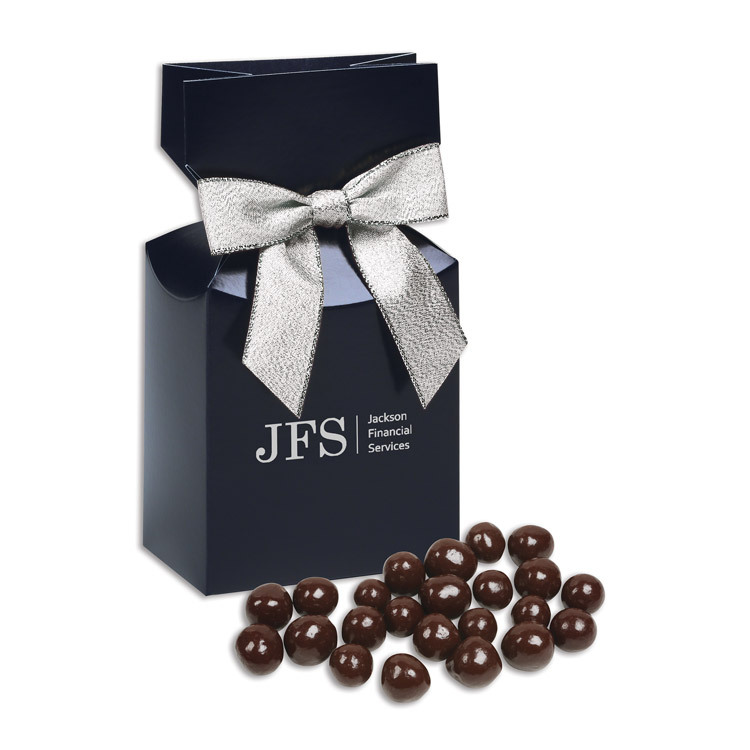 Also Available with English Butter Toffee & Milk Chocolate Almonds FDA inspected facility. CPSIA & Prop 65 compliant. * Because of the special pricing on this gift, no other discount offers may be applied. * This item is available in limited quantities and on a first-come, first-served basis. *** Made in the USA! *** Functionality meets Elegance: This Walnut and Maple cutting board, firebranded with your logo, will generate goodwill for years to come. Crafted from two great American hardwoods, Black Walnut and Hard Maple, this rectangular cutting board has a gently rounded shape that can easily transition from a cutting board to an elegant serving tray. Simply cut on one side and serve on the other. Both Walnut and Maple are considered to be eco-friendly sustainable hardwoods. 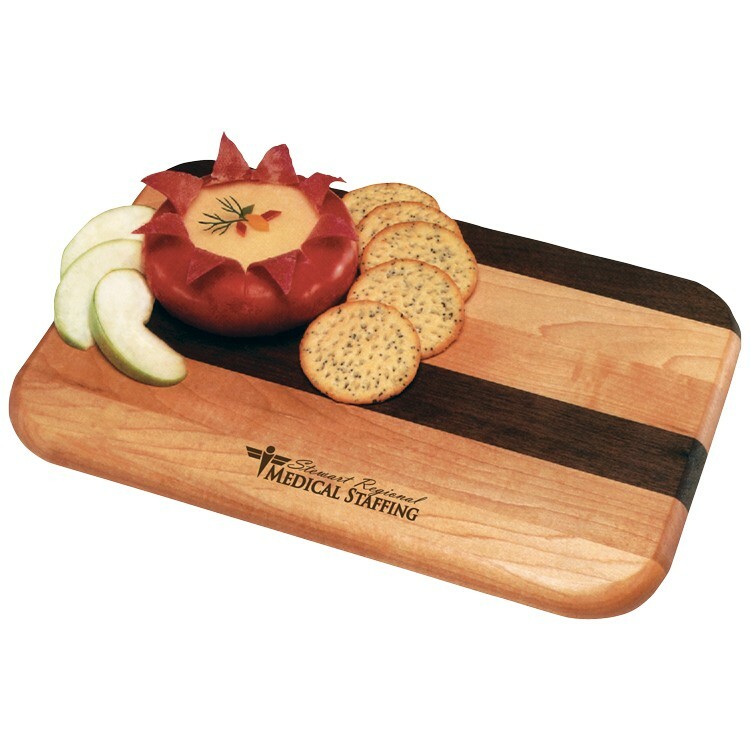 Hardwood cutting boards are naturally antibacterial making them more sanitary than many other cutting boards. These eco-friendly kraft pillow pack boxes make great thank-you or room gifts. 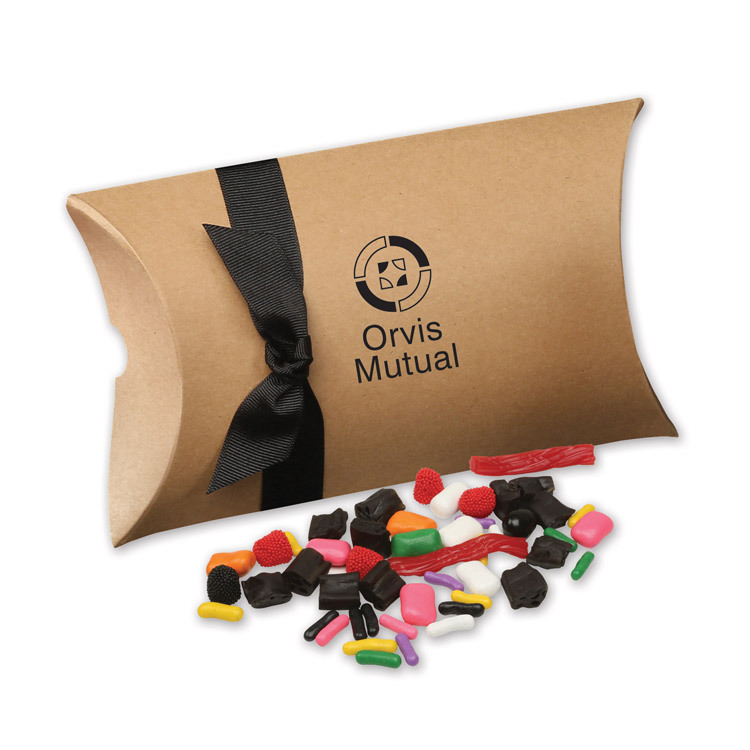 Recipients will open the box to discover seven-ounces of colorful licorice lovers mix. 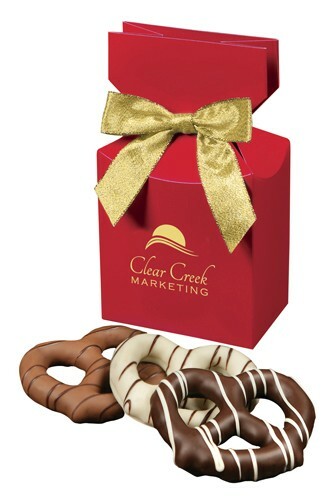 Your logo is foil-stamped in black and the box is tied with a matching black grosgrain ribbon. Also Available with Jumbo Cashews, English Butter Toffee, Chocolate Almonds, Chocolate Cashews, Cocoa Dusted Truffles and more! FDA inspected facility. CPSIA & Prop 65 compliant. * Because of the special pricing on this gift, no other discount offers may be applied. * This item is available in limited quantities and on a first-come, first-served basis. If your company has a product that’s transported by tank truck, here’s the ideal gift. Each truck is a hand-crafted, hand-painted collectible. Both sides feature your logo foil-stamped in gold. 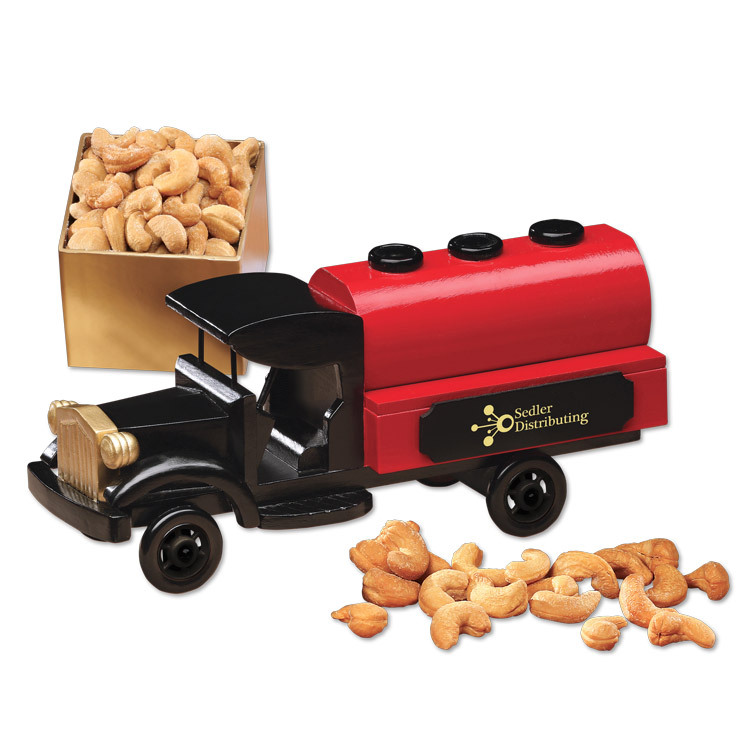 Each truck is accompanied by our famous gourmet delights; Extra Fancy Jumbo Cashews, five-ounces. Because trucks are handmade, no two trucks are identical. Imported. Also Available with English Butter Toffee, Pecan Turtles, Cocoa Dusted Truffles, Deluxe Mixed Nuts, and Milk Chocolate Almonds. FDA inspected facility. CPSIA & Prop 65 compliant. 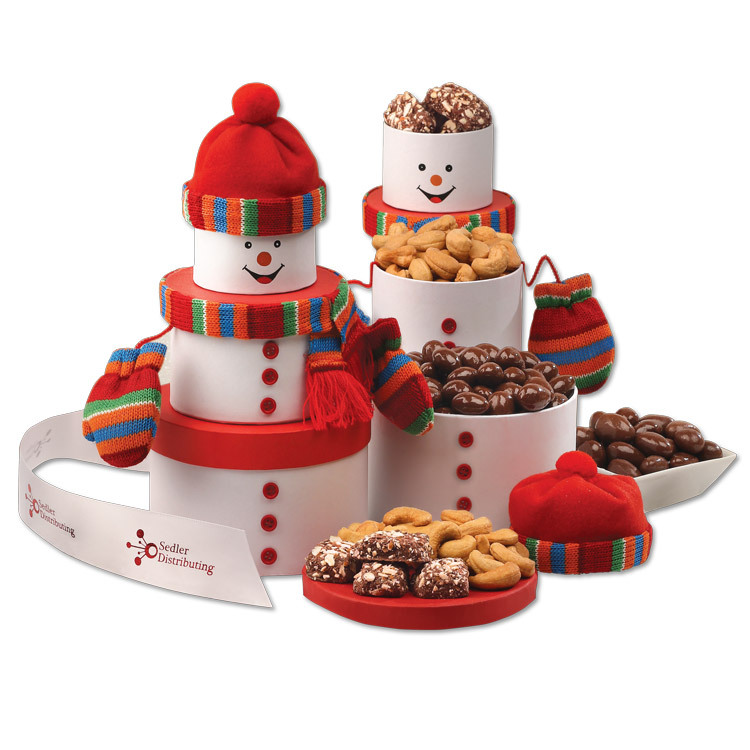 Now you can get the same premium treats for your promotional needs that you are used to having in your gourmet food gifts! 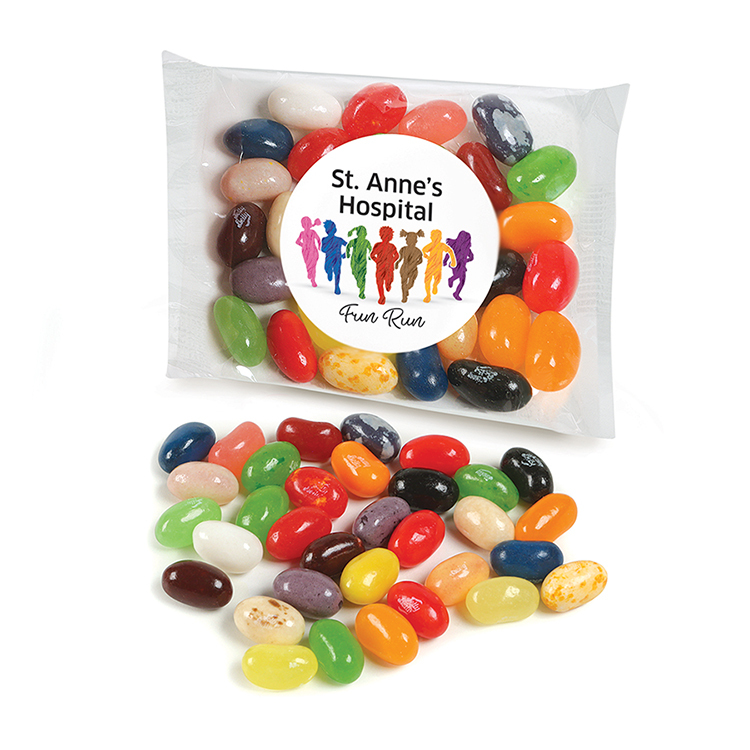 Jelly Belly® jelly beans are everyone's favorite, with a delicious assortment of flavors sure to please every palate. 1.25 ounces in total. FDA inspected facility. CPSIA & Prop 65 compliant. Nestled inside this classic burgundy gift box are four Maple Ridge Farms favorites guaranteed to thrill each and every recipient. The hand-tied golden ribbon adds a sophisticated touch of elegance. Your logo is gold foil-stamped onto the lid. 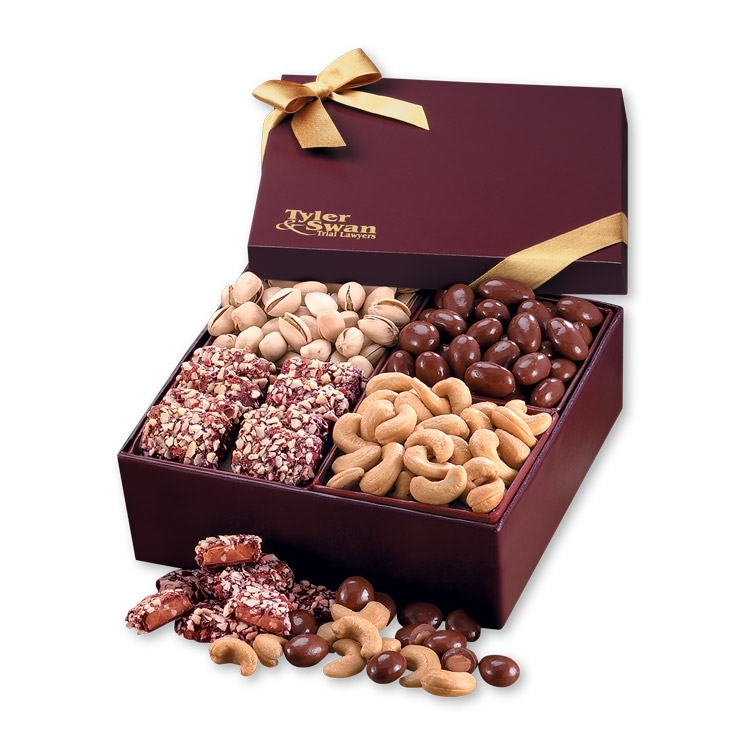 Inside we place a most delectable assortment... freshly roasted Extra Fancy Jumbo Cashews; Chocolate Covered Almonds; Jumbo California Pistachios; and our signature English Butter Toffee. Nearly one and a half pounds of delicious goodness! Food gifts, always the best business gift! FDA inspected facility. CPSIA & Prop 65 compliant.